How Are Engineering Organizations Performing Today? This eBook is of most value to Engineering Managers in companies serving discrete manufacturing industries. Specifically, this eBook is helpful for Engineering Managers looking to counter recent trends that are undermining the productivity of their engineering organizations. Today, there is little doubt that designing products is intensely difficult. Engineers are presented with conflicting requirements and constraints, all of which must be solved with great designs developed on shorter schedules. That difficulty, however, doesn’t negate the need to understand how successful engineering organizations are in achieving their goals. In fact, understanding how most engineering organizations perform in today’s strenuous operational environment offers a performance baseline. Comparing organizational performance between cohorts that employ different methodologies and technologies offer insight into what actually makes an impact. 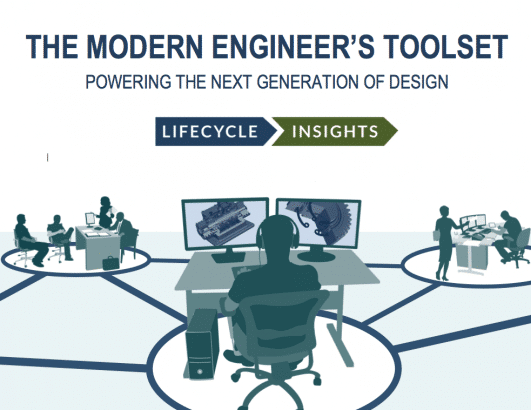 To that end, as part of its The PLM Study, Lifecycle Insights surveyed engineering organizations about their organizational performance that would, in aggregate, measure the overall success of their product development projects. The results, shown in Figure 1, reveal shockingly low success rates. These organizations don’t meet product development goals for the vast majority of projects they undertake. One of five engineering projects are cancelled, translating into development costs that will never be recouped. Nearly another quarter of all projects miss their release dates, making it nigh impossible to launch or deliver the product on time. A little less than half of the remaining projects are released on time, but not without shifting resources around in an emergency mode. The reality is that only 15% of all projects are released on time without shifting resources. Obviously, these are not desirable outcomes. But to better understand the root cause of these issues and glimpse some potential solutions, we must ask a simple question: why do so many engineering projects fail?